I was recently watching an episode of Jay Leno’s Garage and as always when I see classic cars I began to get a bit nostalgic. The sixties “Muscle Cars”, the memories of “Cruising Riverside” in Spokane. The hours and hours I spent messing around under the hood, the speeding tickets (ya Mom, I got a few of those.) Boy, they don’t make them like that anymore! Then I began thinking about the new generation of “Muscle Cars” and I began pondering the changes over the years. I clearly remember 1980 when GM put the first on-board computers in cars. I was working at a Chevrolet dealership at that time, and it was quite a shake-up. I remember hearing (and saying) “computers do not belong on cars!” I mean seriously, computers were not even in homes yet. We had no clue what computers would evolve into in the automotive world. The 1980’s era computer controlled fuel systems vehicles seem a bit barbaric compared to what we have today. Cars today have multiple on-board computers/modules that control almost everything on the vehicle, even things as simple as backup lights are controlled through a body control module. So I began to process what that means in the difference between the original muscle cars and the newest generation and how they evolved through the years. 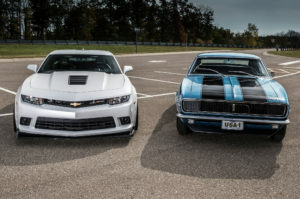 I researched the specs between the legendary 1967 Camaro Z/28 and 2014 Camaro Z/28. Cosmetics, well they are both beautiful cars. The 1967 was 184.6 inches in length compared to 190.4 in the 5th generation Camaro. The wheel base specs are 67 – 108.1”, 2014 – 112.3”, not a lot of difference. Comparing these to other generation Camaros surprised me, I always felt the second generation Camaros seemed like a pretty big car compared to the 1st generation and the 5th generation. In reality the 70’s version had a wheelbase of 108, almost identical to the ’67, with the sheet metal growing 4 inches, but smaller than the 2014 in both wheelbase and overall length. So…Clearly the newest generation Z/28 outperforms the 1967 Z/28. Does that make it a better car? I don’t believe there is a correct answer to that question. The 1967 Z/28 is a true classic, but looking at production numbers, it is likely the 2014 version will be as well. Both versions have great body lines. I would love to hear feedback on your thoughts about these two cars and how things have evolved, good or bad?